Why Do People visit the Chiropractor? at a Typical Chiropractic Office Visit? The data for this study was from the National Health Interview Survey (NHIS), which is the principle and reliable source of comprehensive health care information in the United States. The NHIS dataset provides a large-scale nationally representative sample regarding chiropractic use. The study noted that 63% of patients go to Chiropractors for low back pain and 30% for neck pain. They found that only 3% of patients reported that Chiropractic care did not help them. What Are the Chiropractic Clinical Assessments? Some spinal pain can be serious. These usually involve compressive neuropathology. Examples of compressive neuropathology include disc herniations, lateral recess stenosis, and central canal stenosis. Although each of these conditions can be successfully managed by Chiropractors, they often need advanced diagnostics (MRIs, etc. ), and sometimes require surgical intervention. Chiropractors are well trained to examine and recognise cases of compressive neuropathology and to make appropriate referrals when necessary. Statistically, compressive neuropathology is quite rare, constituting only 1-2% of Chiropractic clinical practice. As well as the standard orthopaedic and neurological tests used to determine if a patient has compressive neuropathology, chiropractic clinical assessments can include X-rays, posture analysis and joint range of motion. These assessments show a patient’s proprioceptive integrity. A large majority of Chiropractic pain patients have lack of proprioception, causing joint pain and immobility in the area. 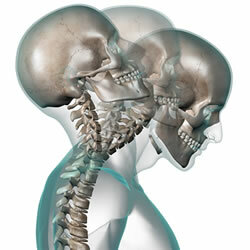 Chiropractors focus on the treatment and management of spinal pain syndromes. Chiropractors first rule out or confirm the presence of compressive neuropathology. A series of orthopaedic and neurological tests are carried out, usually with imaging, such as x-rays or possibly an MRI. If a compressive neuropathology is present, the Chiropractor may decide to treat the condition, refer the patient to another provider, or co-treat the patient with another provider. Discovered mechanical problems are dealt with mechanically, including ergonomically, exercise, traction, tissue work, and spinal adjusting. When spinal joints do not have optimum movement, the pain gate at that level is open. Chiropractic adjusting (specific manipulation) increases the firing of the proprioceptors, creating a neurological sequence of events that closes the pain gate. The reduction in pain is often immediate, depending on levels of concomitant inflammation. The quality of proprioception is a significant factor in the state of the pain gate. Improved proprioception closes the pain gate. Chiropractic adjusting improves proprioception. Consequently, chiropractors are noted for their treatment and management of pain syndromes, especially for spinal pain syndromes. 1. Adams J, Peng W, Cramer H, Sundberg T, Moore C; The Prevalence, Patterns, and Predictors of Chiropractic Use Among US Adults; Results From the 2012 National Health Interview Survey; Spine; December 1, 2017; Vol. 42; No. 23; pp. 1810–1816. 2. Viderman T; Experimental Models of Osteoarthritis: The Role of Immobilization; Clinical Biomechanics; November 1987; Vol. 2; No. 4; pp. 223-229.